It’s that time of year again! 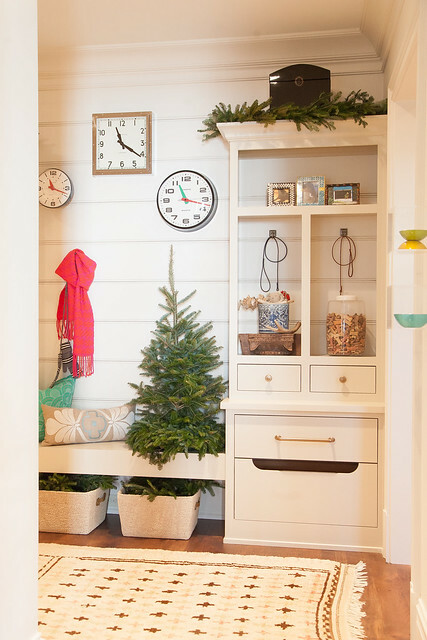 The much anticipated Atlanta Homes & Lifestyles Home for the Holidays (formerly known as the Christmas House) opened its doors on November 15, and is open through December 8th. I was able to see the house on Monday, and it is full of beauty and inspiration. Here are some highlights of the spaces, although this barely scratches the surface – you will have to visit yourself to see all of the magnificent rooms! The exterior of the house, designed by Harrison Design Associates and built by Dovetail Builders. Photo credit Kate Byars Photography. Most images taken by me, except where noted. The dining room was beautiful, with soft colors and special monogrammed chairs. Barbara Westbrook Interiors designed the room and it was a highlight. I thought this was an artful close in shot of the dining room, which was gorgeously lit with three full size Christmas trees. Photo credit Occupy My Family on Instagram. The stair hall was also one of my favorite spaces. 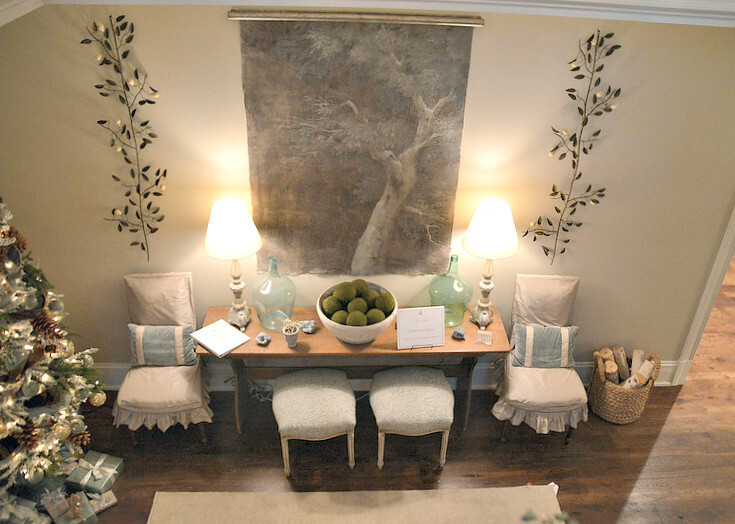 The soft color scheme worked well in this transition space. It was a nice place to linger, and the gracious proportions of the space lent itself well to taking in all of the special details in the room. 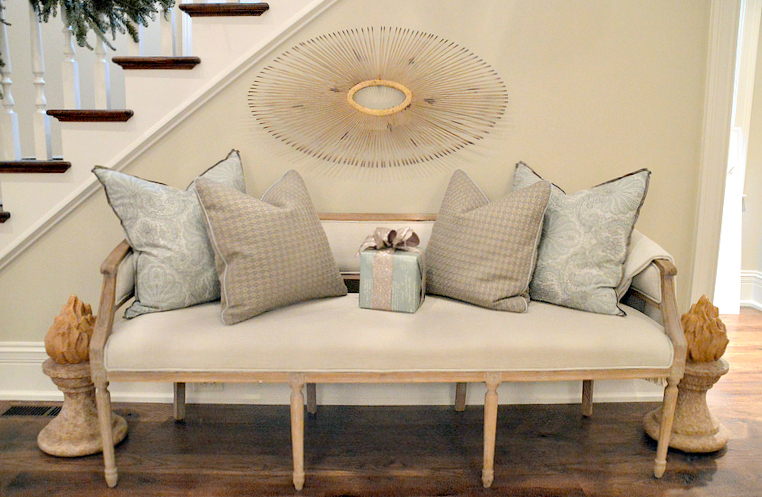 Interior design by Courtney Giles Interiors. A close up of the bench in the space. It was the perfect size and scale, and the pillows are such a pretty touch. A view from the stairwell allows an appreciation of the entire vignette on the other side of the hall. This perspective shows the flow of the stair hall, which is a central hub of the house. 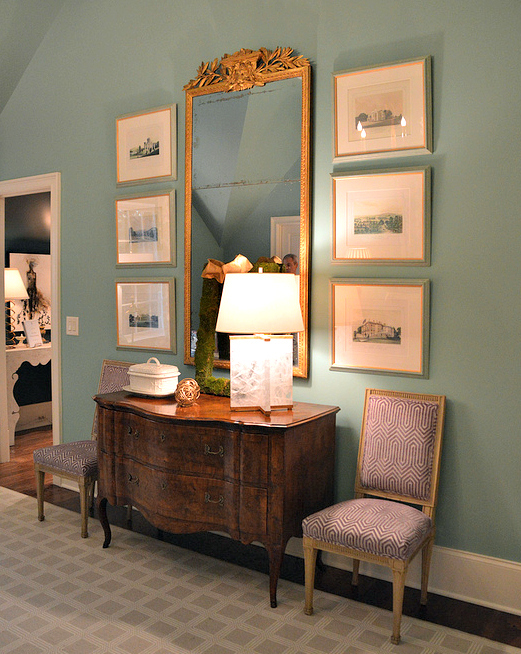 The hallway upstairs featured a high impact collection of framed intaglios. This space was also designed by Courtney Giles. I love the color palette she selected. 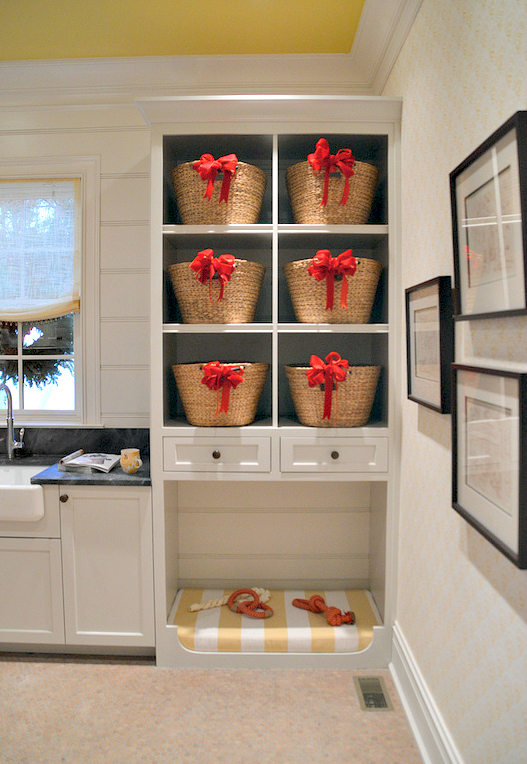 The mudroom, by Insidesign. Photo credit Kate Byars Photography. 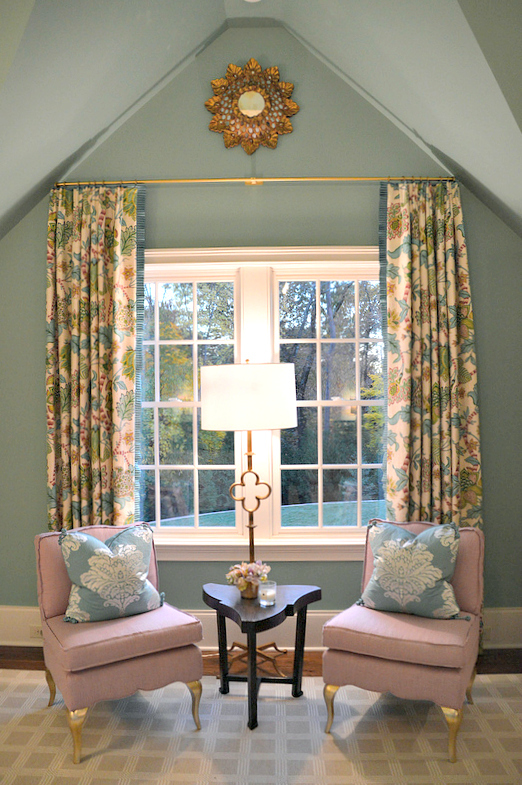 Karen Ferguson from Harrison Design Associates designed this room. Harrison Design Associates selected all of the interior finishes for the house, and I was particularly taken with the floor of this laundry room, which is made up of round cork. 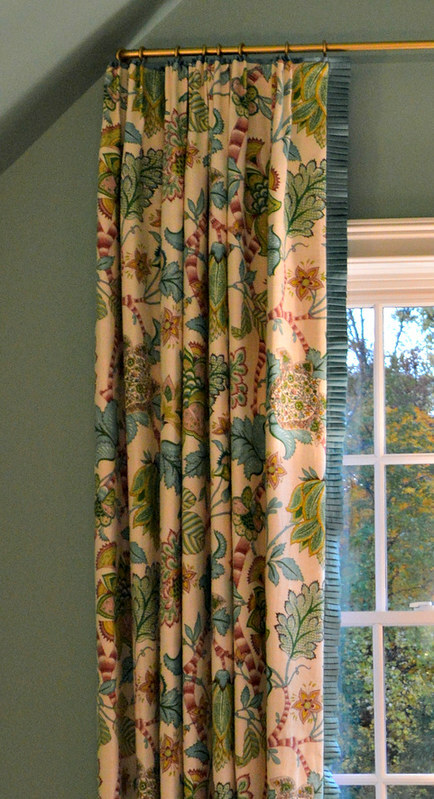 I also love the soft drape of the sheer roman shade in this window. The dog bed built into the wall is a nice touch! 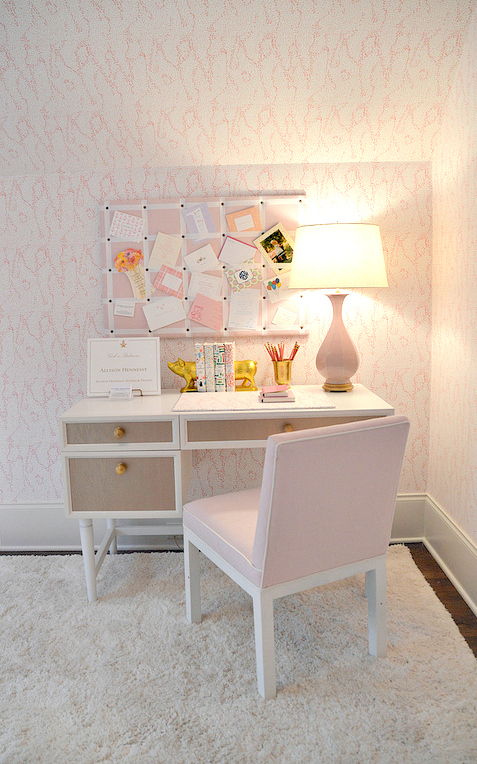 The girl’s room by Allison Hennessy Designs was very pretty and fresh. 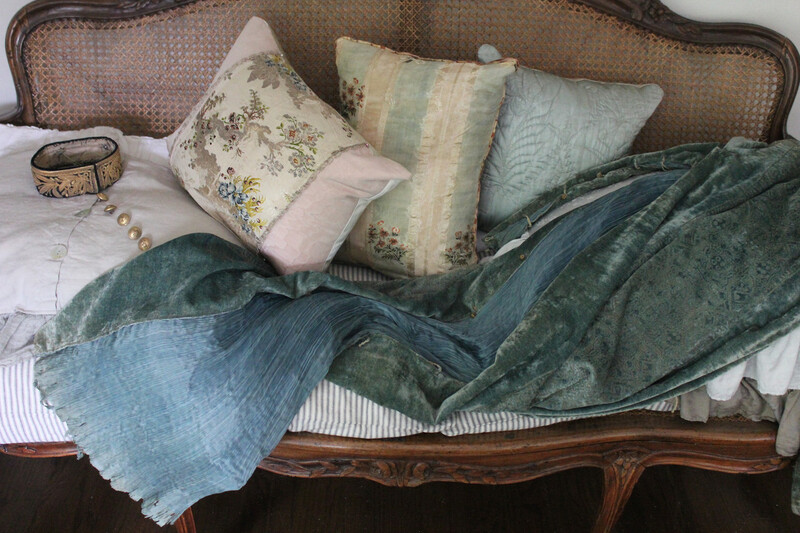 A vignette from the guest suite, featuring antique furniture from Parc Monceau and fabrics from Duralee. The lamp is from Circa Lighting. The designers, Heather Dewberry and Will Huff, were in the room when I visited and filled me in on the design process and the sources for the beautiful items in the room. 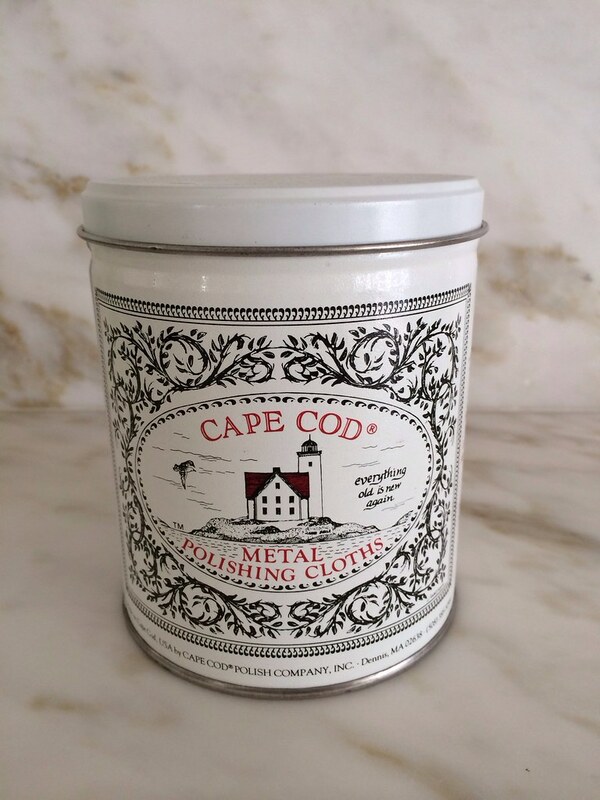 This room is full of beautifully crafted details – Huff and Dewberry noted that many of their clients are requesting a return to some of the custom details that make high end interior design so special. Note the leading edge on these curtains. The pleated detail made with the same fabric that is on the headboard and bedskirt (not pictured) is really lovely and very custom. I snapped a quick instagram picture of the exterior of the house as I was leaving; the sun was setting, and the glow of the Christmas trees and the lights on the roofline were too pretty to resist. I pass by this house many times a week (it’s on one of my regular routes), and have watched it being built over the past year. It was so gratifying to see it complete and beautifully decorated. 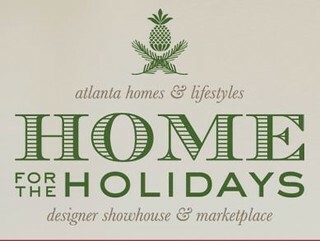 I highly recommend a visit to the Atlanta Homes & Lifestyles Home for the Holidays if you are in Atlanta. There is nothing like seeing and experiencing a showhouse first hand, and being inspired by all of the many exquisite details. Have you visited? What did you think? 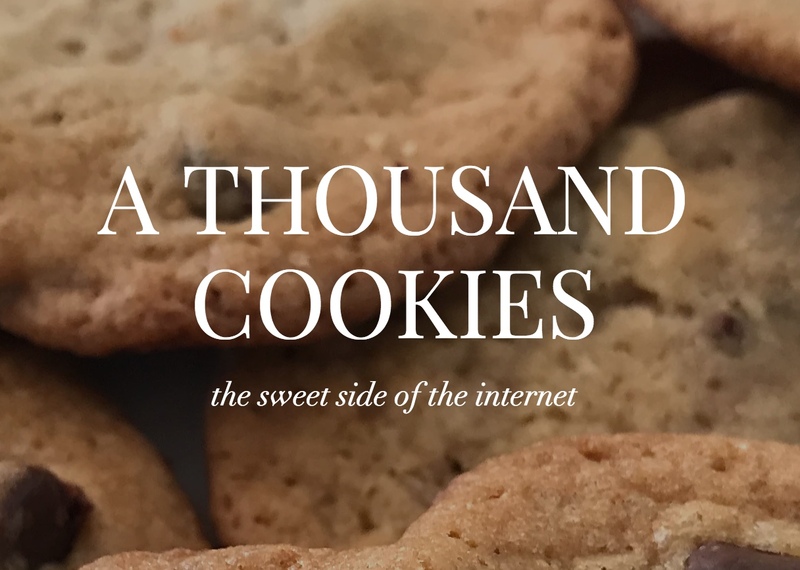 If you haven't visited, do you have a favorite image in this post? I focused on the more traditional spaces. 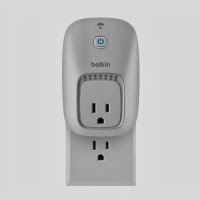 There were many others that were more transitional and very streamlined. It was a great mix of styles and designs. Take a trip down memory lane and visit the 2012 AH&L Christmas house here; the 2009 Christmas House here. i'm so in love and wish i could swing by! the girl's room! thank you for sharing these images, and now i must revisit them and stare. I never tire of looking at beautiful Christmas decorations. This has made me think about mine! i need to get organised.The girl's room is so pretty too! How I wish I was closer...looks like a good one! 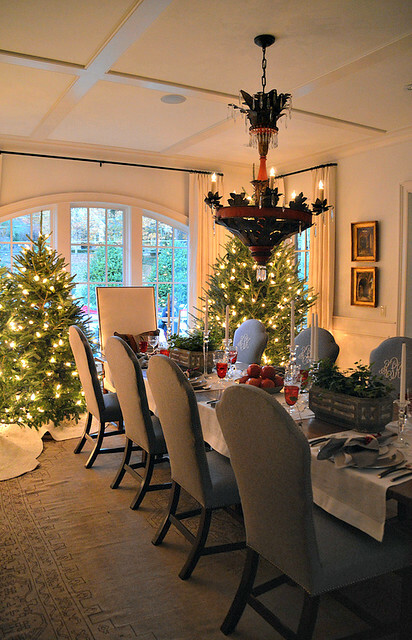 SO festive and elegant, love going on showhouse tours! Thanks for sharing the highlights. What a beautiful house! Those Christmas decorations are amazing. My friend owns an antique store and we are going to Las Vegas to check out their Christmas antiquities. I want an older Christmas decoration theme this year. Every year my town has walk throughs where you walk through people's houses to look at their Christmas decorations and I saw this house with nothing but antiques and it looked incredible. I hope I can duplicate it. You have the best show houses in Atlanta! These houses are gorgeous! 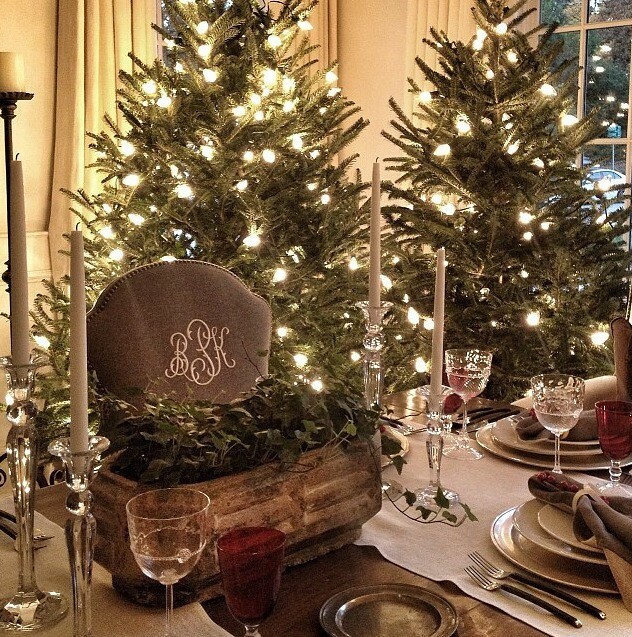 Love the Christmas decoration, it brings so much inspiration and Christmas spirit! Beautiful house, but I WANT TO SEE THE KITCHEN! Stunning, Holly! The entire home is gorgeous, and I think the dining room is my favorite. A most gorgeous home!! The showhouse has so many unique areas, love the Intaglio filled wall! It is stunning, thanks for sharing it with us. Oh swoon! How I love a good home tour. Just always wish there were more pictures! Sigh! Thanks. You got some great shots Holly….I added a link to this post from mine! Each room is full of inspiration! Thanks for sharing! Holly, great to see you on Monday and thanks so much for this. 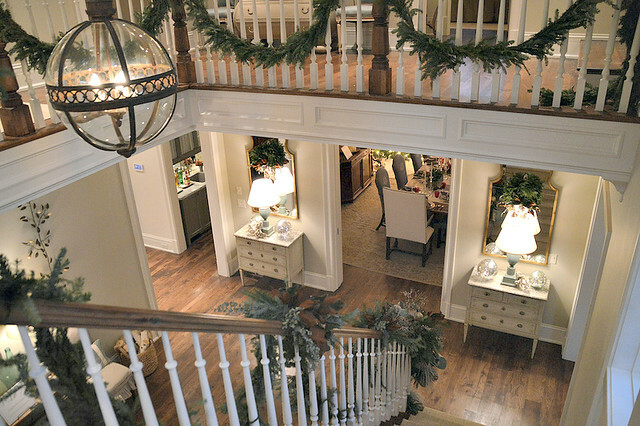 Wanted to let you know that Courtney Giles Interiors designed both the downstairs and the upstairs Hall. So, she is responsible for that fabulous grouping of intaglios that you mentioned. Thank you for this post. 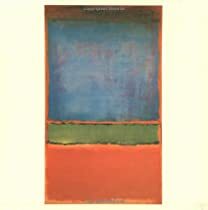 I saw this ad for Atlanta Home & Lifestyle Mag. (i live in Texas) and wanted to know more and you granted my wish. 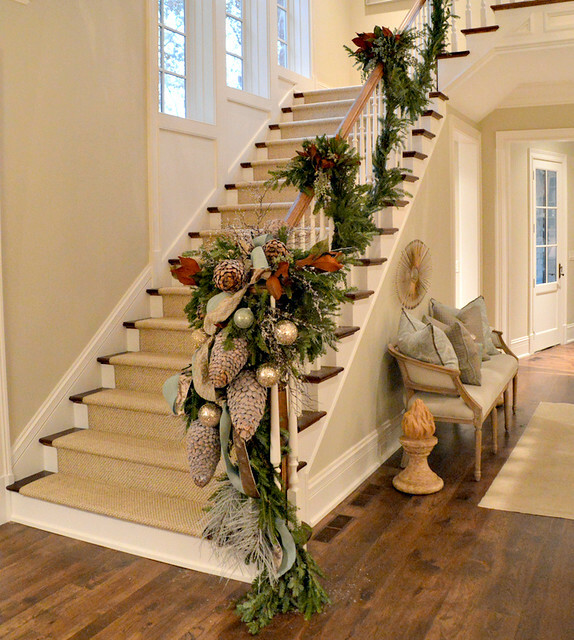 I love the home, decor and holiday design and the staircase is my favorite too! Now off to B&N for the Dec. issue of this magazine to see other decor ideas. I'm pleased for the opportunity to view the house but I have one criticism. It would be an impossible feat to sit on the bench in the first hall photo without damaging the art piece on the wall behind it. I realize it may be intended as a place to leave one's hat...but I bristle at designers who, no matter the circumstances, choose to ignore convenience in their choices. I, too, appreciated the wall of Intaglios and the handsome gray chairs in the dining room and other features. The dog bed is clever and will be remembered. My own pooch has a designer mattress in her crate. Oh, this makes me want to race over to Atlanta to enjoy this beautiful home! It was truly spectacular! I wish we had the quality of homes like this on our tours…our IPC tour usually does and will take place in a couple of weeks. No matter…this was stunning and I got so many wonderful ideas! 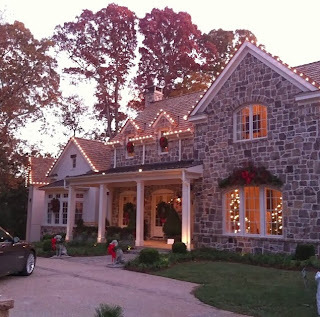 I was glad to see wreaths on all of the outside windows…what is your opinion on that? I struggle every year with thinking it's over done and yet I still do it! I am always fretting that my mother in law doesn't' like it! LOL! oh, well…if she doesn't she is always kind and gracious and acts like she does! Thanks again for sharing this gorgeous and inspirational home!